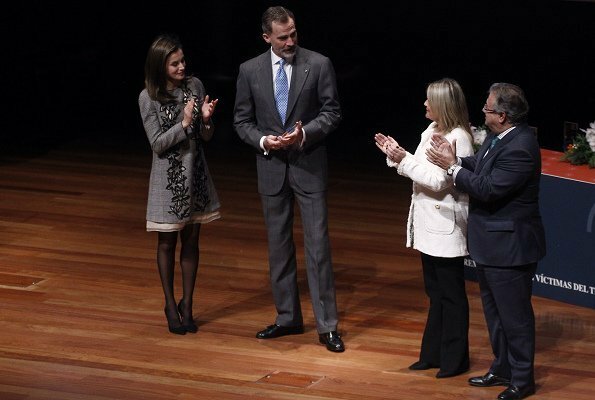 On January 15, 2018, King Felipe of Spain and Queen Letizia of Spain attended presentation ceremony of 2017 awards of Victims of Terrorism Foundation held at Reina Sofia Museum in Madrid. 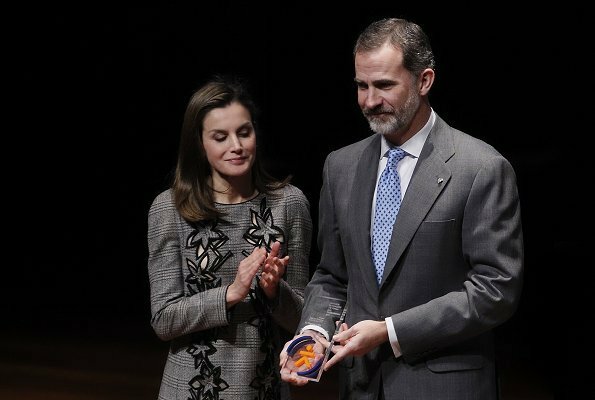 King Felipe was honoured with 2017 Adolfo Suárez Award. Victims of Terrorism Foundation is a non profit organization established on December 19, 2001 under Antiterrorism Pact. At the ceremony, Queen letizia wore Prince Of Wales floral-cutout Dress by Carolina Herrera. Didn't Like this dress the first time, and I haven't changed my mind, personally I find it hard to believe that it is CH creation. Love the coat, and she looks rather pretty otherwise. I like the dress, even though I realize I'm in a minority (based on comments when she wore it previously). I even like the frilly bit at the hem! Even better is how her coat exactly matches the length of the dress. She looks lovely. Yes, it's difficult to believe that it's a Carolina Herrera dress.